It was 5 years ago to the day, that my Dad and I went down to Nebraska do the final touches on the line up of what would be called, “The 3rd Most Earth-Shattering Auction of all Time,”- The Lambrecht Chevrolet Auction. I still remember meeting with the family, that smell in the dealership, and all the junk that was on top of the new cars. Walking in the weeds out at the farm and seeing the row of brand-new pickups, just waiting to get back on the road. There is a little-known fact, that over half of the first day cars were in Kansas, and we had to truck them back to Nebraska for the sale. The were there for “safe” keeping, which didn’t turn out to be so safe, but an almost heist. 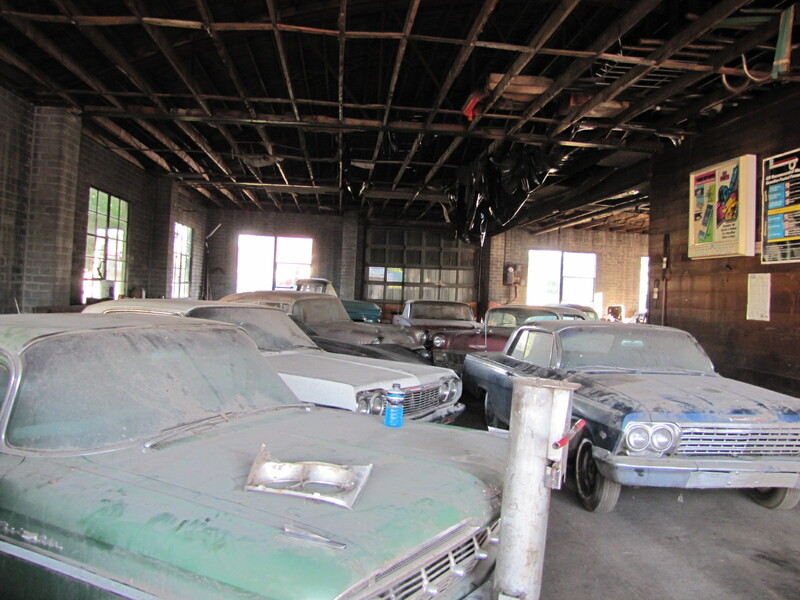 But titles and MSO’s in a tote always in my freezer in my house or the back seat of my pickup, the cars came back to Nebraska to join their sisters for the Lambrecht Chevrolet Auction and the story began. My Dad, A Chevrolet Man to the Core, well I couldn’t keep him out of there. We took loaders, roll offs, and my husband, son, and his friend, started cleaning out the dealership and moving out the cars for pictures for the first time. All we did was pry open the garage door and one man stopped, “I’ve been waiting for over 40 years to see this day.” Residents for years had tried to buy back their cars to a resounding, “NO.” One by one, stuck wheel loosened, tires aired up and replaced, they rolled out for their big debut. First it was the 1964 Chevrolet Impala, white with 4 miles, then the 1963 Impala, the Cameo pickup. With just 1 mile on the odometer and the floor mats rolled up behind the seat. Pretty soon we had quite a big crowd and Sheriff Rick had to patrol traffic. We swept out the dealership, moved 3-30-yard roll offs of debris and barrels of used oil out of the building and put the cars back in their place. I then began to work with Sheriff Rick and the town on traffic control and security. We were exhausted and thrilled at the same, history in the making. I loved it. I had grown up with cars all my life, and now was putting my experience to work. It was exhilarating! I carefully took my paperwork, and that started the debate with the state of Nebraska on the MSO’s. Marv Spomer was a great help from Minnesota. After many meetings, and the threat to me of going to jail if I didn’t hand over my MSO’s, we got an exemption from the state. We titled the cars and I got to keep my paperwork for the new cars. People don’t know that I guarded that paperwork with my life, and fought to keep it from being destroyed. NE has that MSO are supposed to be turned in and destroyed and converted to title. But I wasn’t going for it. It paid off. I knew the importance of that original documentation. If we wouldn’t have followed the exemption, it was $5000.00/per MSO or 55 cars X $5000.00 each-That’s a big fine!